I had the pleasure of being a “snowbird” and escaping the cold to fly south for the winter to Miami, Florida. Originally invited for a family wedding, my husband and I used the time away from home as an excuse to explore the lesser known places in the 305. Everyone knows about the beaches, but what about the art? 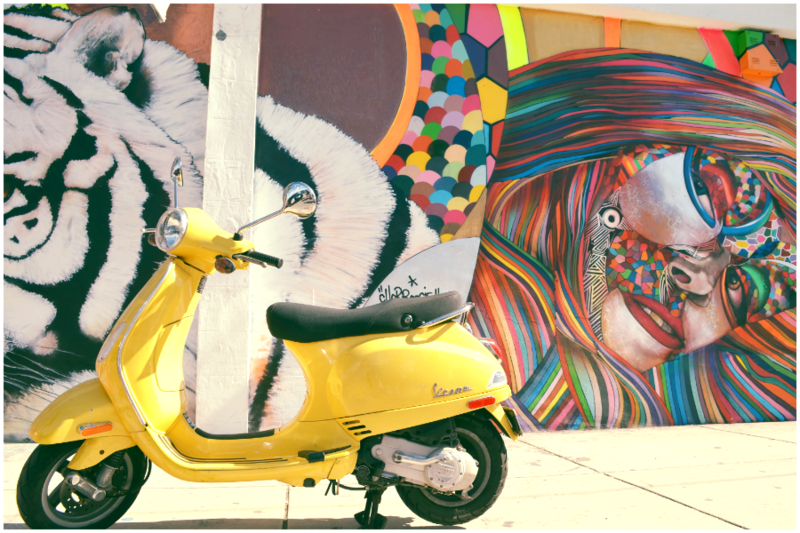 Miami is having a contemporary, cultural renaissance! 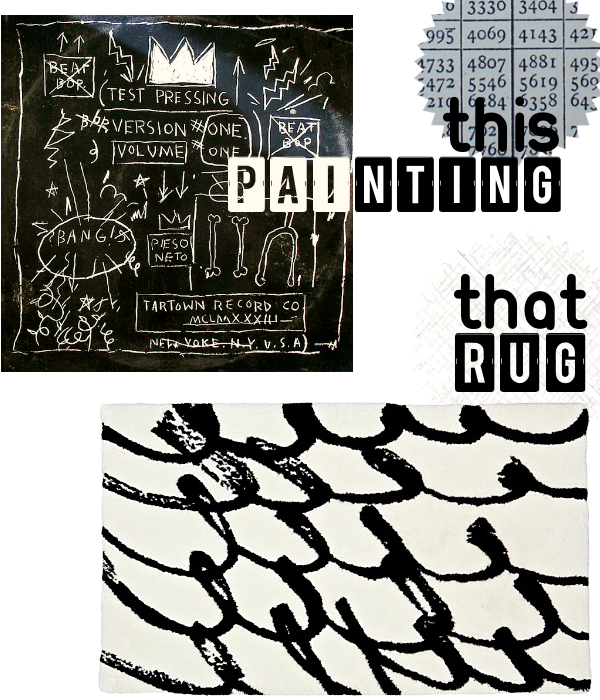 The constantly shifting roster of visual arts organizations in the coastal town provides tons of vacation stimulation. It’s not just the historic, Deco District anymore. I recommend visiting the Rubell Family Collection, Museum of Contemporary Art (MOCA) at North Miami, de la Cruz Collection, PAMM | Pérez Art Museum Miami and the Lowe Art Museum. 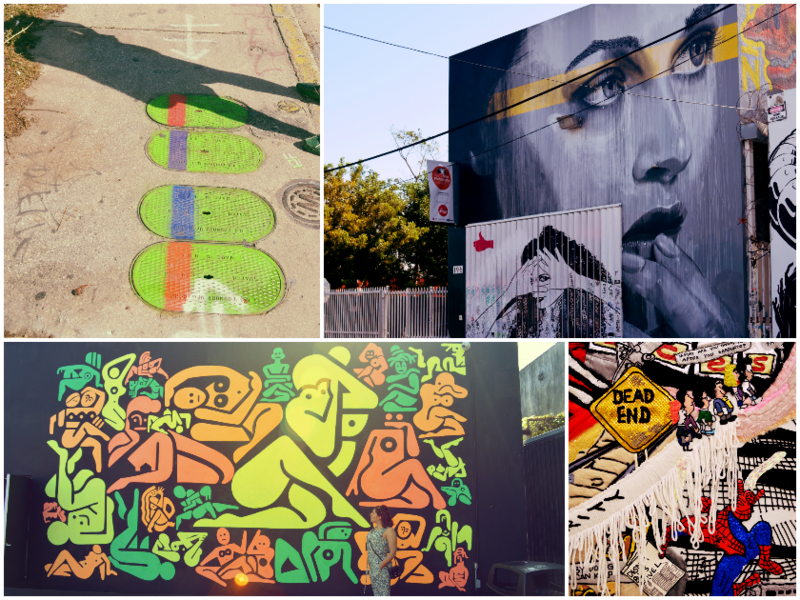 My favorite neighborhood and cultural space is The Wynwood Art District. This warehouse laden landscape is home to over 70 galleries, museums and collections. Originally part of a textile manufacturing region, the area is flurried with abandoned factories and lofts turned exhibition spaces. The paved streets are still packed with garbage bins, discarded signs, and broken windows but that only adds to the character. In this way, the neighborhood reminds me of SoHo’s gentrification cycle. 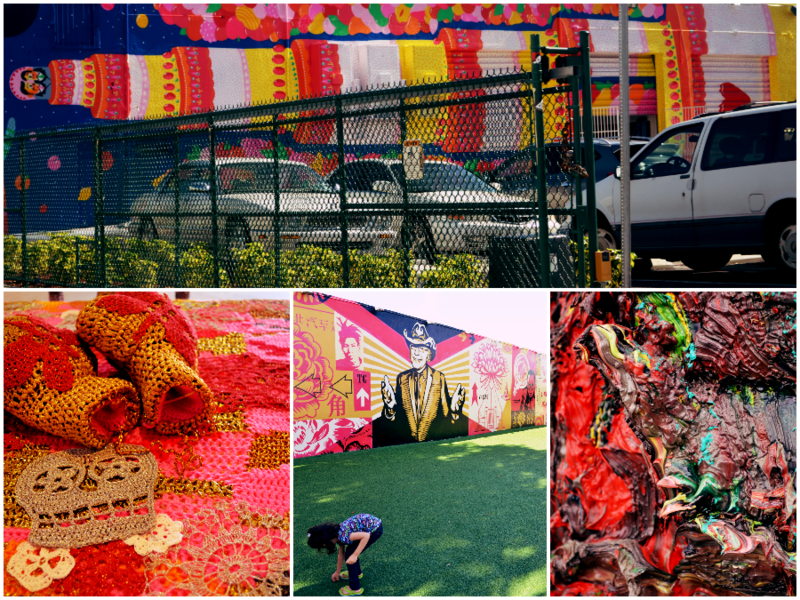 The outdoor, expansive murals are vivid, vibrant and awe-inspiring. This is where graffiti masterpieces go on display. 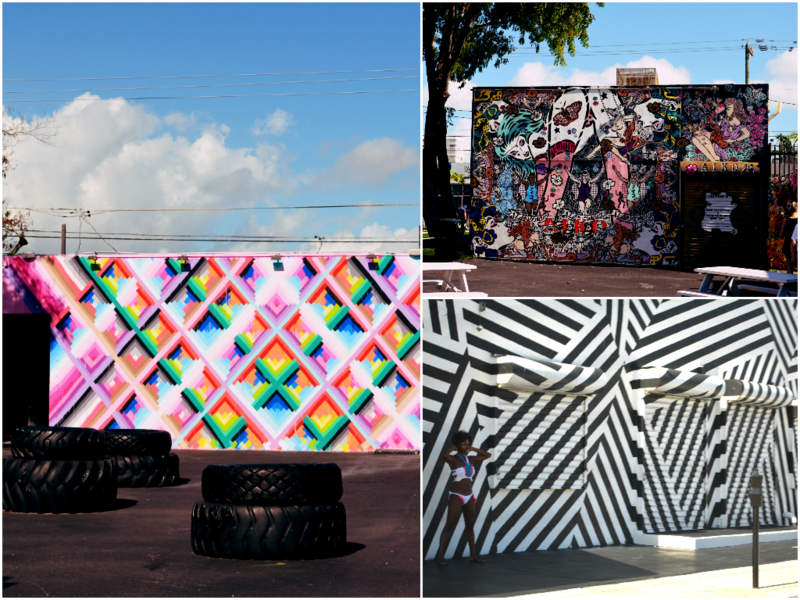 Conceived in 2009, a special area known as Wynwood Walls has brought the world’s greatest artists working in the graffiti and street art genre to Miami. While I was visiting, I was lucky enough to see some artists in action. It’s not rare to see walls fenced off so that a new mural can pop up over the course of a few days! A lot of the art is inside buildings, and hidden just beyond unmarked doors, but most of it can be seen from the car, or by walking through the district – smack-dab on the wall themselves. For example, I discovered these hidden sewer Ninja Turtles just by looking downward! 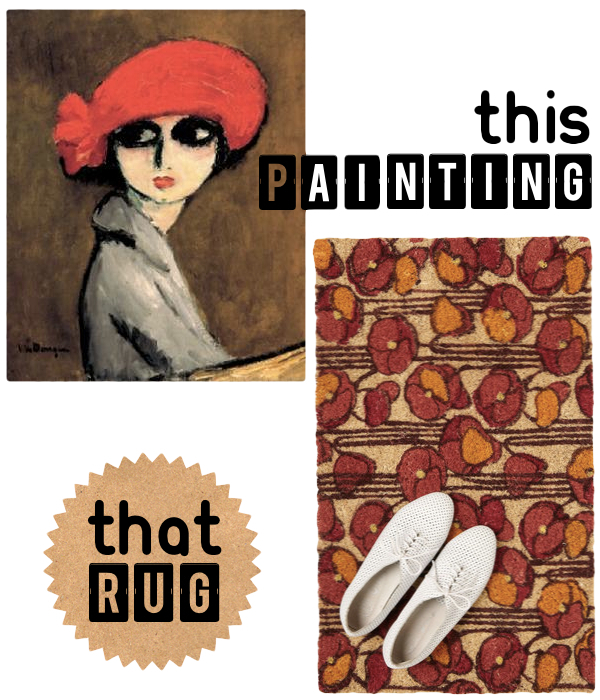 Sometimes the art is even on rooftops. It’s like a giant I Spy. You can treat yourself to the works of Kashink, Chor Boogie, Trek6, Os Gemeos, How & Nosm, FAILE, Invader, Liqen, Nunca, Shepard Fairey, and Miss Van. 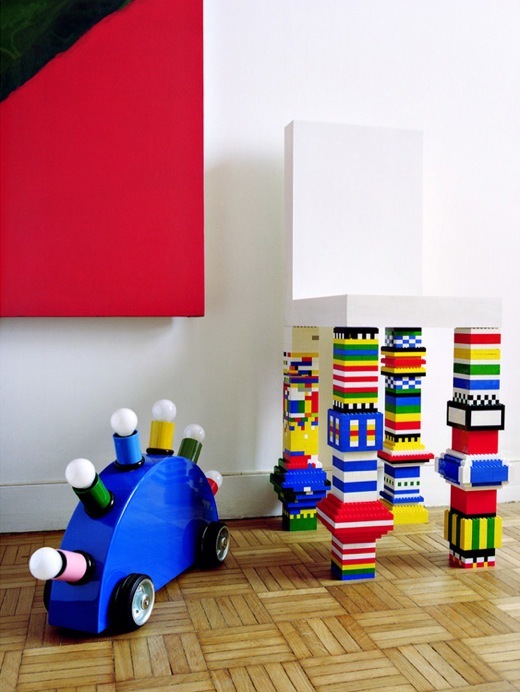 The ubiquitous primary colored blocks and construction toys known as ‘lego’ were invented by a carpenter from Billund, Denmark, who began making wooden toys in 1932. The company used to refer to the concept as “Automatic Binding Bricks”. 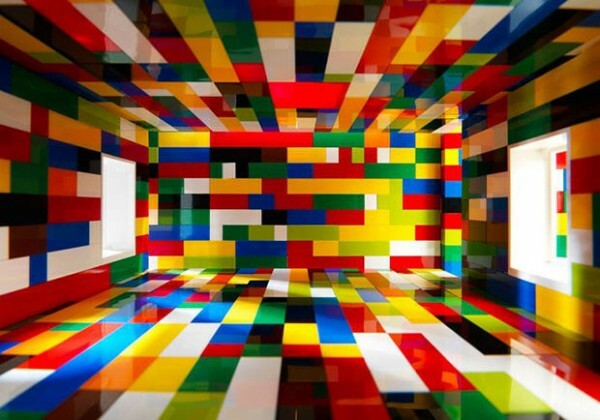 The term ‘lego’ itself comes from the Danish phrase leg godt, which means “play well”. 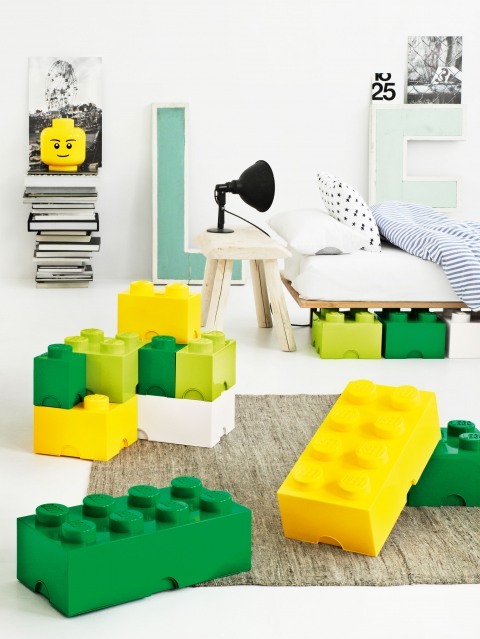 Indeed these blocks do play well, not just as toys but as home decor. 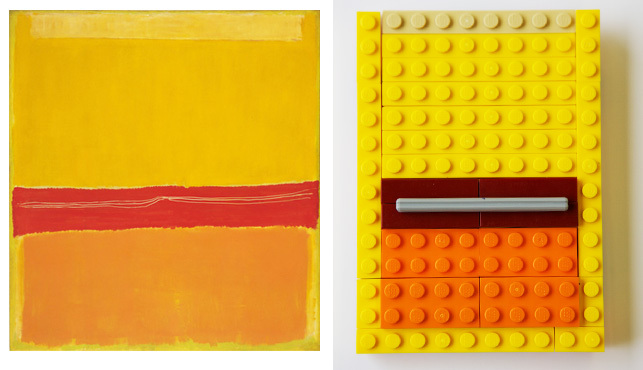 Something about the square lines, the bright colors, and the whimsy of childhood help LEGO designs to be ultra modern and clean. 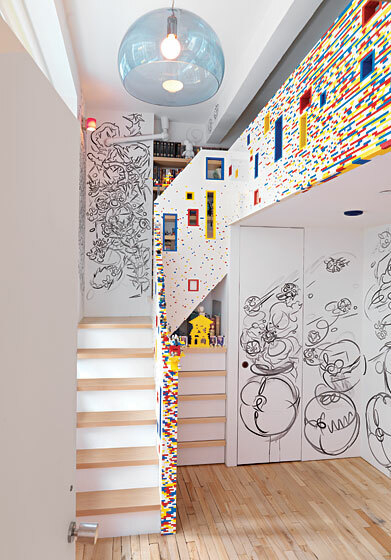 The company has been known to branch its brand into video-games, clothing, robotics, movie franchises, cartoon characters, books, magazines, retail stores, and theme parks; however the world of LEGO interior design is still new! 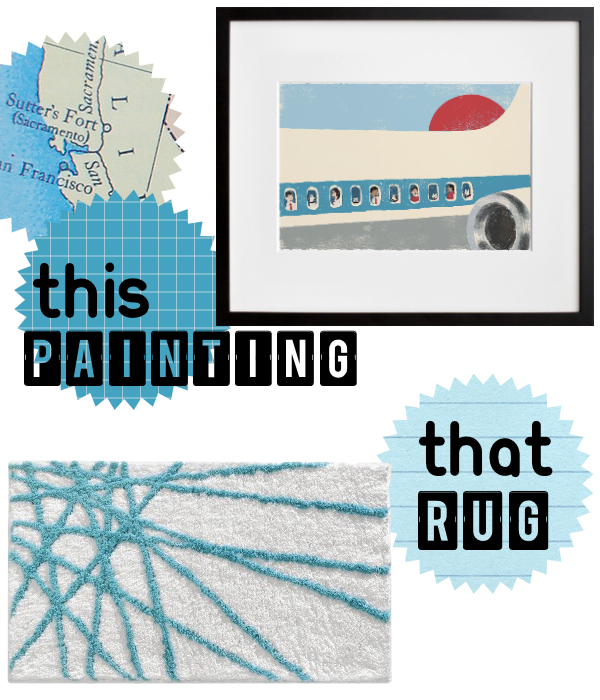 This charming rendition of Rothko’s No. 5/No. 22 was put together by John Wilson, it seems the staff members at MoMA (the Museum of Modern Art) had a very sleepy Friday afternoon, it seems. 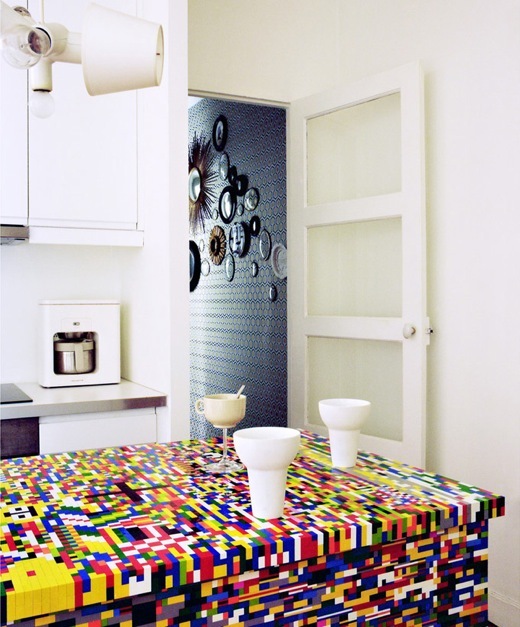 Introducing the 20,000 brick apartment; Photographs by Thomas Loof/Art Department of NY Mag. 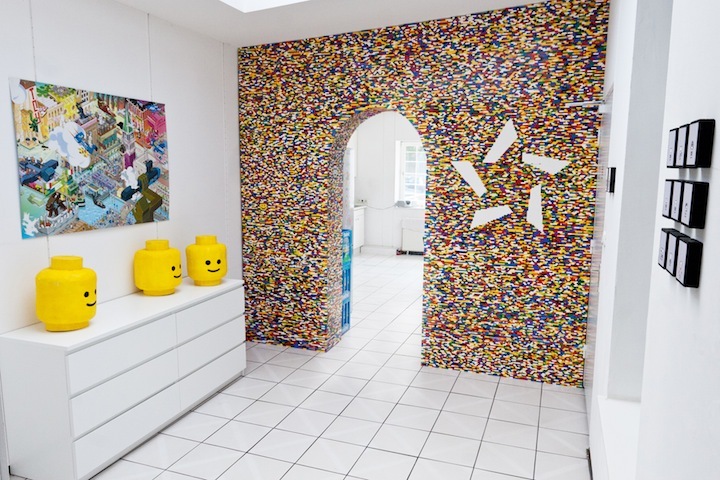 55,000 bricks and one year later the genius men at NPIRE, a small agency in Hamburg, Germany completed this 3 foot wide Lego wall divider. For further information, go here. 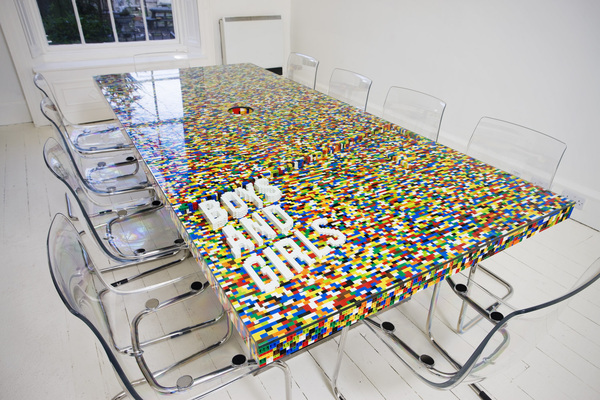 This board room table consists of22,742 pieces clicked together with traditional lego construction techniques (no glue), a 136mm grommet is located in its center. It sits on a polished Stainless Steel square hollow section structure built by B.A. Engineering of Prussia St and is topped with a 10mm sheet of toughened glass manufactured by Action Glass. Photography by studioseventyseven, for further information go here. 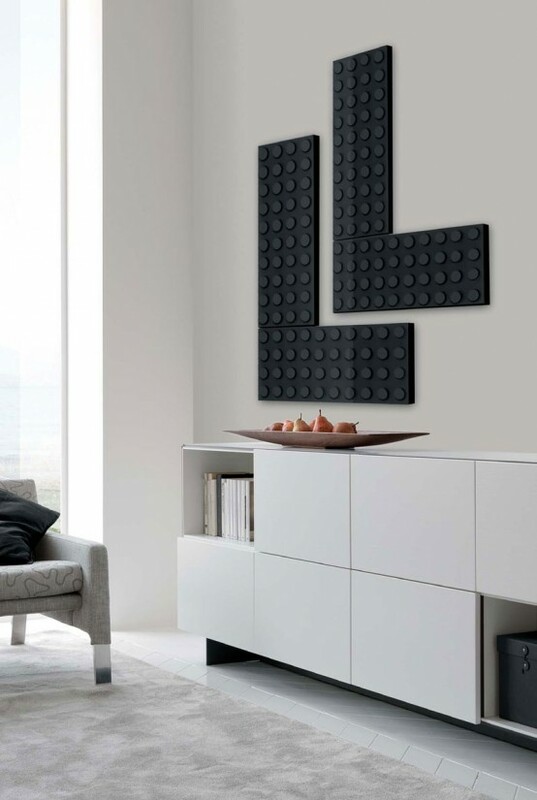 Brick by Scirocco uses oversized Lego replicas to make modern day radiators and radiator covers. Definitely a vast improvement over unseemly rusting pipes! The modern Lego brick was patented at 1:58 P.M. on 28 January 1958; bricks from that year are still compatible with current bricks. Technically those “vintage” blocks still play well with their ultra contemporary polymer counterparts. I am particularly proud of the LEGO brick because its patenting falls on the date of my birthday, yours truly. 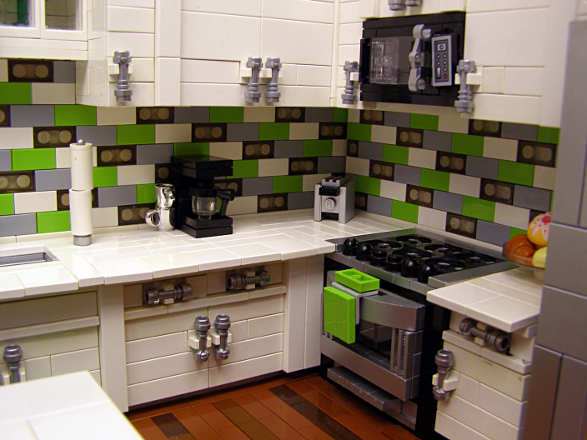 When in doubt, just aim to live in the glossy and commercial world of a LEGO brick. 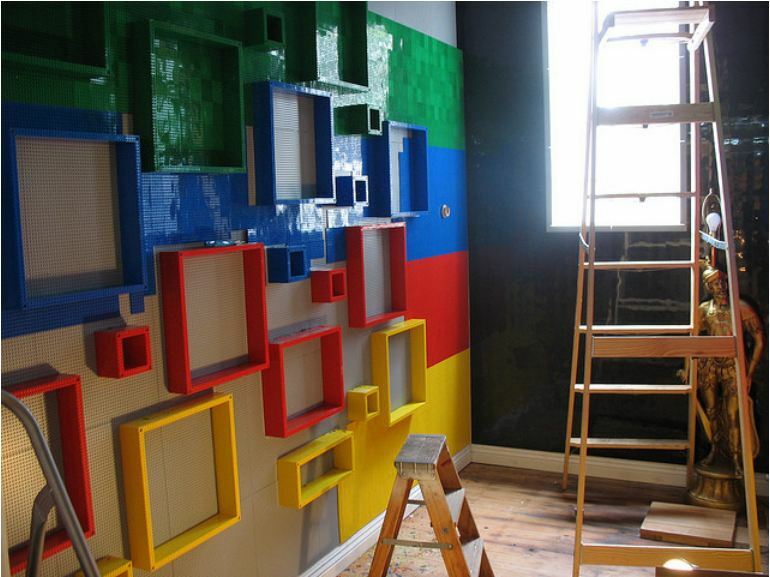 Brazilian artist and photographer Valentino Fialdini‘s creates vacuous miniature Lego rooms, more here. 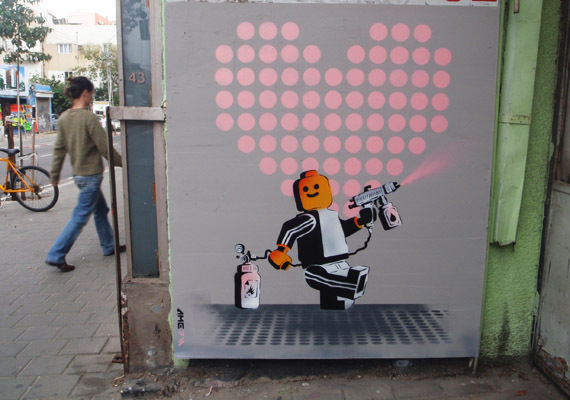 Modern day British graffiti artist Ame72 (pronounced ‘aim72’) is also known as Jamie Ame. He has a background in graphic design and advertising. 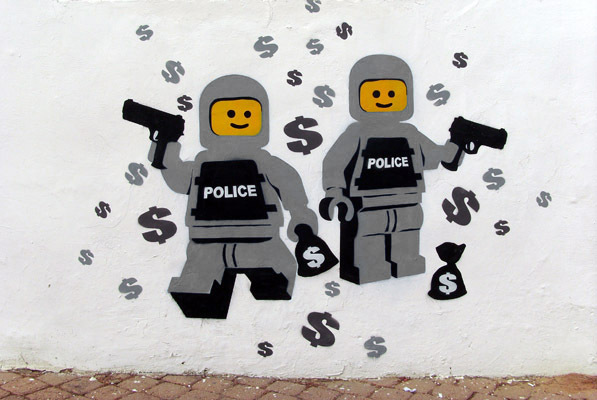 In the three images above he uses stencils to re-appropriate the look of “the Lego man”. 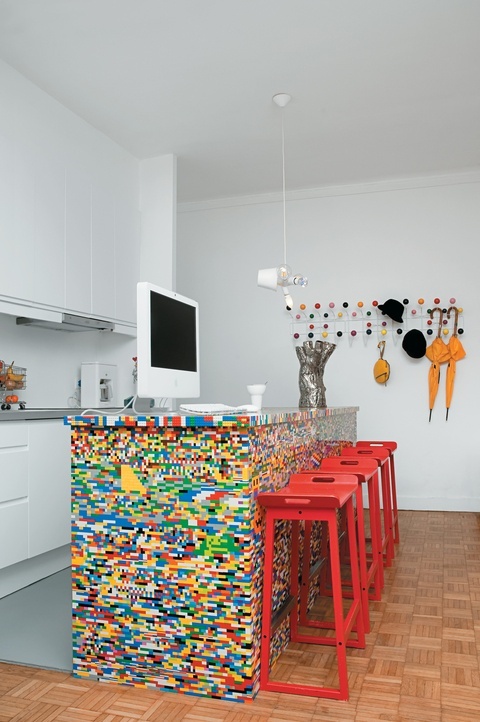 LEGO Kitchen and Chairs by Munchausen, a duo formed by Parisian designers Simon Pillard and Philippe Rosetti. More images here. 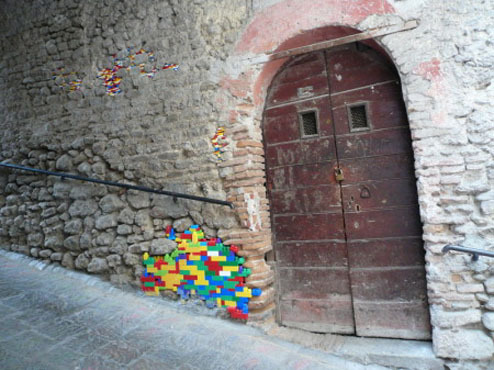 Artist and Lego enthusiast Jan Vormann went around the quiet town of Bocchignano, Italy filling in dilapidated walls with lego band-aids. LEGOhaulic built this midcentury-modern style house. For more images visit the builders site or go here. This is from a project done in cooperation with the LEGO company and Scott Sternberg of the Band of Outsiders clothing label. The room is located in a clothing store in Hollywood called Opening Ceremony. 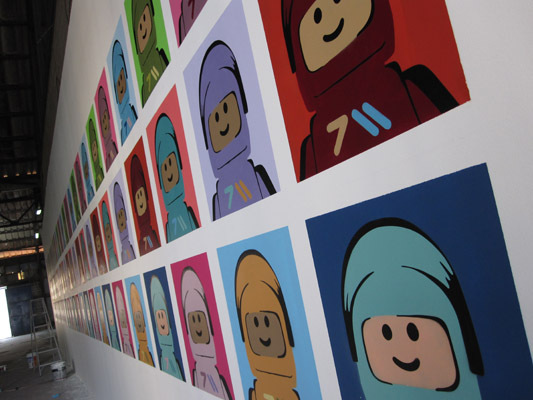 It was made to showcase the new LEGO inspired men’s line from Band of Outsiders. Check out Scott’s site and more pictures at: playwell.bandofoutsiders.com or in this photostream. Etsy creators and artists never fail to amaze me! 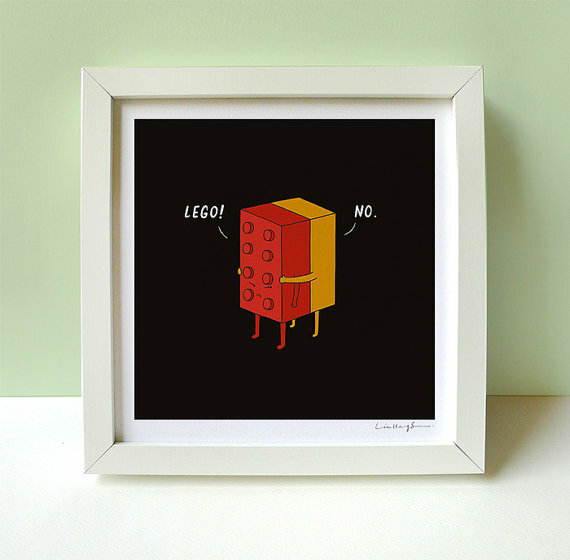 Check out this “I Will Never Lego” print here. Feminism, pride, opportunist, acceptance – where did ads like this go? 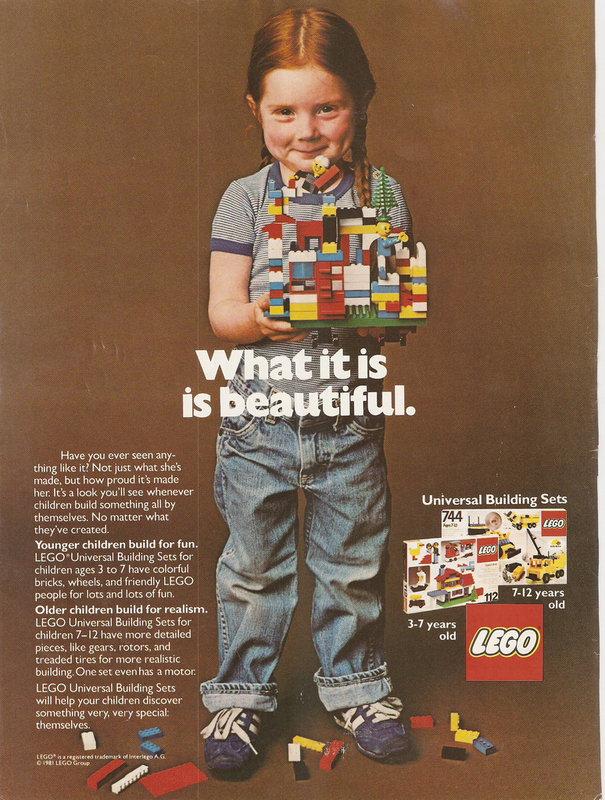 This 1981 LEGO ad pulls at my heartstrings. 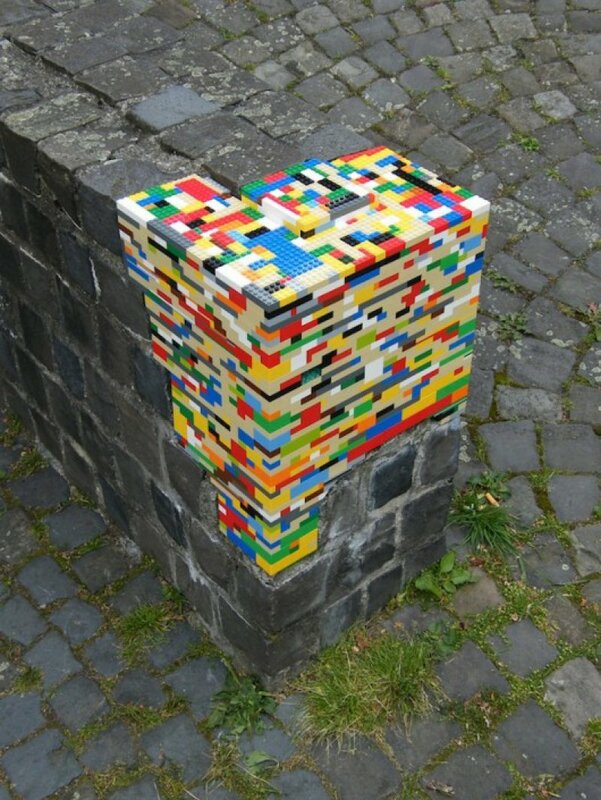 Remember, anything is possible with LEGO, your only limit is your imagination. What will you build?